Akasha’s Hideout is the seventh instanced dungeon in TERA. It’s ideally suited for level 50 characters but is available through Instance Matching to characters between levels 48 and 54. This dungeon offers five tough bosses and a hard mode for even more challenge. NOTE: It is highly recommended that you complete Golden Labyrinth before attempting Akasha’s Hideout. Bosses in that dungeon can drop holy potions of protection, which remove a powerful debuff called Akasha’s Withering. All players receive this debuff upon entering Akasha's Hideout. You must defeat four bosses—including one of your oldest enemies—before confronting the goddess Akasha. While the dungeon proper is accessible to any character level 48 or higher, it is the conclusion of the Allemantheia plotline (started at level 38 and featured in Necromancer Tomb and Golden Labyrinth), and is meant to be encountered immediately after completing Golden Labyrinth. In her latest scheme, Akasha kidnapped the archmage Serion, the living embodiment of the Core. Along with your allies Elleon and Fraya, you foiled her plan to steal the Core's power for her own, but she escaped. In the Golden Labyrinth, you used Akasha's devices to transfer that power to Fraya instead. Afterward, Elleon tracked the god to an underground lair beneath the Fyrmount region, and you plan to intercept Akasha there. This section will walk you through the quests and encounters leading up to and inside Akasha's Hideout. The tactics presented are suggested by players like you and draw on extensive play experience, but are not absolute guarantees of success. As with all things TERA, player skill and a healthy amount of common sense are what you'll need to win—but we've compiled a few tips to help you. 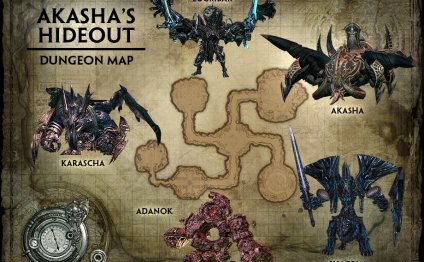 The entrance to Akasha’s Hideout is deep inside a cave mouth in Molten Reach. Elleon sends you to look for a glowing blue cave uphill from (southeast of) Fire Base Valor. The teleportal is inside. NOTE: Although the teleportal (and Instance Matching) may offer passage to both Akasha's Hideout and Akasha's Hideout (Hard), it is highly recommended that you choose the former. Not only will the Hard mode not advance your quests, but all enemies inside have significantly higher HP and attack values. Hard mode dungeons are meant for veteran players with powerful gear, and should not be underestimated. Akasha’s Hideout has a simple structure, with four chambers opening off a central hall, Karascha’s Menagerie. One of the side chambers is an entry hall, and each of the other three contains a boss you must defeat to reach Akasha. Before you go too far into the instance, use a holy potion of protection (received in the Golden Labyrinth) to remove the Akasha's Withering debuff. Akasha’s Withering drains power and endurance, and persists through death. Only a holy potion of protection can remove it. On the bright side, the potion's effect lasts two hours, and also persists through death. As you navigate the hideout, you'll find many undead roaming the halls. Some are "simple" minions, but a few more powerful minions guard access to sealed doors. If you see large barrels near an enemy, approach with caution. Not only do they explode if attacked, but enemy undead sometimes have bows. Make a ranged attack on the explosive barrels against the walls while several enemies are nearby (bombs are excellent for this), and kaboom! Your path is clear. This huge teralith is boss of the Sanguinarium—a chamber between the dungeon’s entrance and the central chamber. Adanok’s minions wake it as soon as you step over the threshold, so be sure you’re ready to fight before you enter. Tanks should position Adanok near the far wall before the healers and DPS get into position. When Adanok curls up, it’s getting ready for a deadly spinning attack. Dodge or block before Adanok attacks or receive a bleeding debuff. Healers should check their teammates after each spin to make sure no one’s bleeding to death. When the ranged attack mark appears above Adanok, it’s preparing to bomb you. Wait for it to pause, then move out of range before it launches the bomb. When its health falls below 75 percent, Adanok uses a three-bomb attack (which, thankfully, it can only use twice). It moves to the center of the chamber before launching these bombs, so when Adanok heads toward the middle of the room, use sleep, stun, and knockdown skills to interrupt it. If your interrupt fails, whoever has aggro should get out of range fast to avoid at least some of the damage. You first encountered Karascha on the Island of Dawn in the “Dark Revelations” quest. Karascha told you he’d be back, and now you get to kill him for real. Karascha uses a triple combo when enraged: a leaping strike, a frontal jump, and another leaping strike, all in quick succession. If Karascha turns away while the tank is still pulling aggro, he’s preparing a ranged fireball attack. The fireball carries a stun debuff in easy mode and a bleeding debuff in hard mode. Anyone hit by a fireball requires healer attention. When Karascha’s health drops to 75 percent, he can use Words of Unmaking, a debuff that can instantly kill an entire party. Words of Unmaking has three stages, and a message appears onscreen at the end of each stage. When you see that Karascha has completed the third stage, hit him with sleep, stun, or knockdown effects to interrupt the skill. Any surviving healers should be ready to heal or resurrect in case the interrupt fails. In hard mode, Karascha summons minions and uses fireballs to harass players at range. But he only does this while not enraged, so keeping Karascha angry makes him easier to take down. When Karascha dies, a floating stone called a strange seal appears. Use the seal to summon either Gilgash’s Pylon, which opens the way to Lugribar, or Akalath’s Pylon, which opens the way to Shagrim. In the regular version of this instance (i.e. not Hard Mode), only one of these pylons will appear. Depending on which you get, you must defeat one of the following bosses to get closer to your ultimate goal: Akasha. TERA Online - Free to Play appena annunciato!